Today’s release of state employment and unemployment data from the Bureau of Labor Statistics showed that over the summer months, most states remained largely on the same trajectory they have been on for the past year, if not the past several years. The pace of overall job growth nationwide was roughly the same as it was at this time last year, although slightly fewer states added jobs this summer than last. From May to August, 37 states added jobs with Hawaii (+1.3 percent), California (+0.9 percent), Massachusetts (+0.8 percent), Oregon (+0.8 percent), and South Carolina (+0.8 percent) posting the largest percentage gains. Over the same period, 13 states and the District of Columbia lost jobs, with the largest percentage losses occurring in West Virginia (-2.0 percent), New Hampshire (-0.6 percent), and North Dakota (-0.6 percent). New Hampshire’s losses are likely not a cause for too much concern, as the state is still on a positive trend over the past six months and year. North Dakota, like other states that had previously benefited greatly from the oil and gas boom, is feeling the effects of the drop in energy prices. West Virginia’s losses are the most troubling, as the state has been shedding jobs quite rapidly since the start of the year. 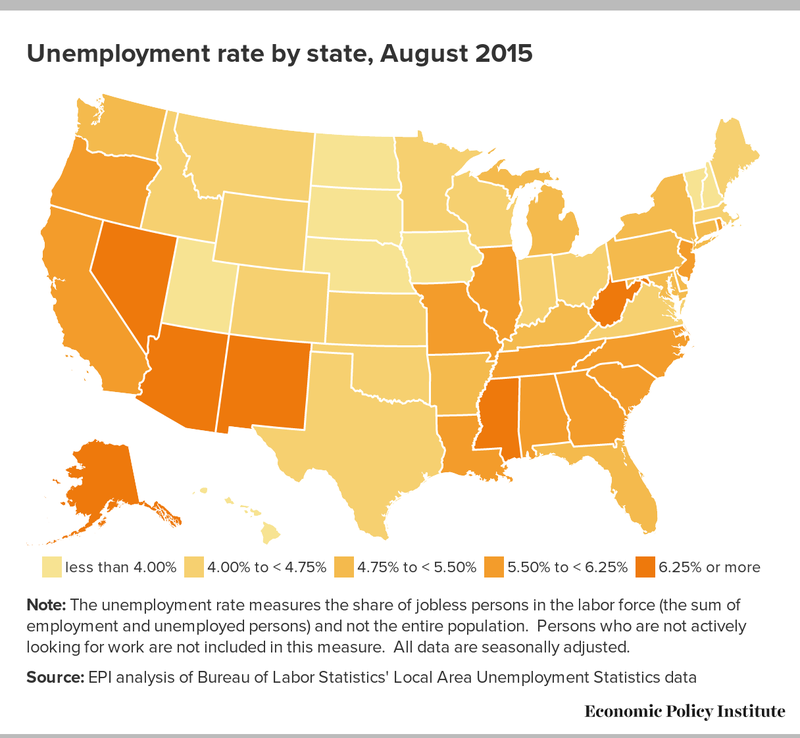 From May to August, unemployment rates fell in 33 states, with New Jersey (-0.8 ppt), South Carolina (-0.8 ppt), Connecticut (-0.7 ppt), Hawaii (-0.6 ppt), and Louisiana (-0.6 ppt) experiencing the largest declines. However, over this same period, the labor force shrank in all five of these states—raising the possibility that at least a portion of these declines in unemployment may have come from job-seekers giving up the job search, rather than finding work. 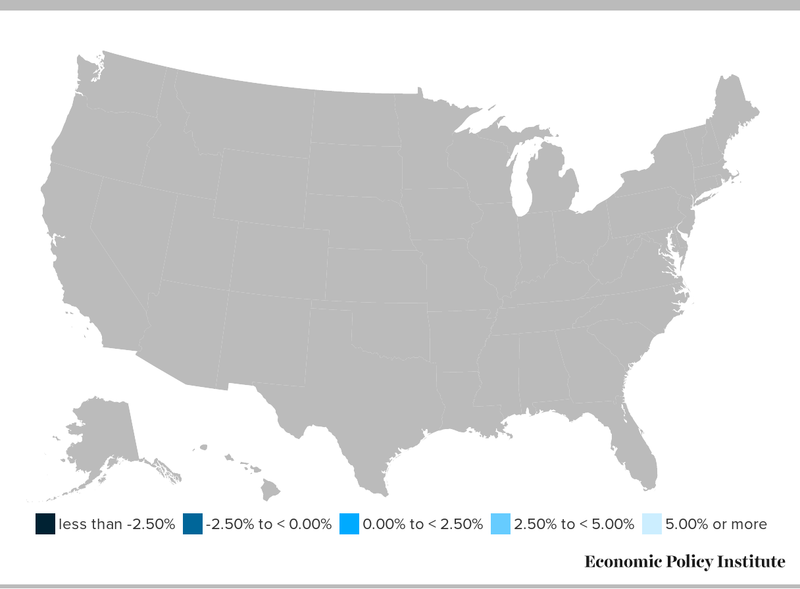 Unemployment rose between May and August in 15 states, with the largest increases occurring in Oregon (+0.8 ppt), Arizona (+0.5 ppt), and New Mexico (+0.5 ppt). Since May, the labor force shrank in 36 states and the country as a whole. For comparison, the country’s labor force grew by 0.2 percent over the same period last year. Ultimately, this decline may prove to be a momentary aberration. But with the number of states that lost jobs or where unemployment was rising, there is ample evidence that the Fed was right to hold off from slowing the economy, as the labor market in much of the country may not be quite as strong as it appears at first glance.